Fitness trainer John Peel joins us again on Total Gym Pulse to show us some of his favorite leg workout using The Total Gym. John says “Leg Day” is a workout day many dread but that it is a crucial day in your overall fitness routine. John begins the leg workout with a single leg squat. Begin with one leg in front of you on the floor and one leg behind you on the glideboard. From here squat all the way down and all the way back up. Keep your core tight as you will be working your upper body as well. Do 15 reps on each leg. Next, John moves into a double leg squat. 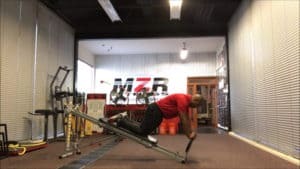 Stand over the Total Gym with the glide board in between your legs. Squat down until you touch the bench and come back up. Make sure you touch the bench or the rep doesn’t count! Calves are the next muscle group in this workout as John lays flat on his stomach on the glide board and grabs the top of The Total Gym. From here, move your calves up and down doing 20-30 reps. Finally, end the workout by turning around and laying on your back with both feet on the squat stand. Do 20 reps going all the way down and all the way up in a squatting movement. Thanks John for joining us today on Total Gym Pulse. Look out for more great Total Gym workouts coming from him soon!